Brendan Harley and his wife, Kathryn Clancy, had their daughter, Joan, through in vitro fertilization. (CNN) -- Brendan Harley beat cancer once as an infant, then faced leukemia as a teen. He survived, but the illnesses left him infertile and feeling guilty. "He knew that I wanted children and was excited to have children, and I think he was sad that he was complicating things," said Harley's wife, Kathryn Clancy, 31. "But if anything, I feel like things just worked out so wonderfully that there was just no need to be upset." 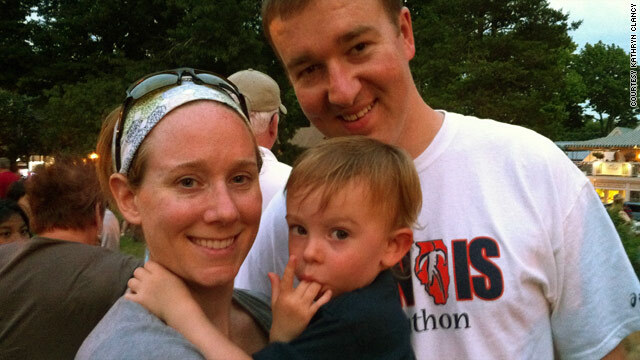 Clancy and Harley, both assistant professors at the University of Illinois, now have a 2 ½-year-old daughter, Joan. She was conceived through in vitro fertilization, a technology that involves combining sperm and egg outside the body and implanting the resulting embryos. "You look at this child and you think, 'How could my life be any different?' I can't imagine how sad I'd be if this wasn't how my life looked right now," said Clancy, a biological anthropologist. Just a few decades ago, the technology that allowed Joan to be born didn't exist. One of its creators, Robert G. Edwards, won the Nobel Prize for medicine on Monday. Many families and doctors said it's a well-earned prize that brought precious lives into the world. "Bob Edwards certainly made a major impact on what we do we do every day, and the four million babies born as a result," said Dr. James Goldfarb, president of the Society for Assisted Reproductive Technology and director of infertility services at the Cleveland Clinic Health Systems. In vitro fertilization technology has evolved since the first successful birth in 1978, Goldfarb said, but he uses another word to describe the work of Edwards and his partner, Dr. Patrick Steptoe, who died in 1988: Revolution. Today, about 1 percent of infants born in the United States are conceived through assisted reproductive technologies, and 99 percent of those use in vitro fertilization, the U.S. Department of Health and Human Services reported in 2009. It's a medical procedure the public knows, doctors said, and infertile couples expect for it to be on the list of treatments. They're well-aware that since 1978, miracles have been possible. The first baby ever born through IVF was Louise Joy Brown, delivered through a Caesarean section on July 25, 1978, at a hospital in England. She gave birth to a son in 2006. Elizabeth Comeau, born Elizabeth Jordan Carr in 1981, was the first so-called "test tube baby" in the United States, and recently had a child of her own. Dr. Dorothy Mitchell-Leef, a fertility specialist in private practice in Atlanta, Georgia, remembers the buzz surrounding Brown's birth at the American Society of Reproductive Medicine meeting shortly after. "It was extremely exciting to hear about it and know that it could be achieved," she said. Early on, Edwards' and Steptoe's work on in vitro fertilization met opposition from some government officials, who were concerned with potential overpopulation, and some religious groups. Catholic church leaders have long opposed in vitro fertilization because, they said, it depersonalizes conception and disposes of some embryos, which they argue is the equivalent to abortion. Doctors remember protesters at medical conventions and fertility clinics that struggled to stay open. Now, they said, curiosity and science fiction-style reporting have calmed. Families celebrate unlikely births, schools might have multiple sets of twins and triplets and the first babies born through in vitro fertilization are having their own babies the natural way. "I don't think it's a stigma to parents or the child," said Dr. Louis DePaolo, chief of the National Institute of Child Health and Human Development's Reproductive Sciences Branch. "There are couples who go through hell, the stress of infertility and going through these treatments. There's no question [why they do it] -- the desire to have a family." The barrier for many couples now is cost. One round of in vitro fertilization can cost about $15,000. Many insurance policies don't cover it, and some couples require more than one attempt. Kathryn Clancy's child, Joan, was born through a procedure that combined Clancy's egg with the sperm from one of Harley's brothers. Harley's other brother had been a bone marrow donor when he had leukemia at 17. Clancy and Harley met with a fertility specialist in January 2007. The following six months were a mix of paperwork, testing, hormones and medications to prepare Clancy's body for the embryo transfer. The process of injecting herself frightened Clancy, so her husband did it for her the first week; cancer had made him comfortable with needles. The first trimester was scariest, Clancy said. Early on, she had cramps and fears of a miscarriage. But the process worked on the first try, with a single embryo. Joan Adele Clancy-Harley was born after a natural labor at a midwife-attended birth center in Massachusetts. It was a "textbook" pregnancy and a nonmedical end to an intense medical experience, Clancy noted. Those are the types of fertility stories doctors like. The in vitro process has been simplified to ease the initial removal of a woman's eggs, to help men with low numbers of sperm and to use the most viable embryos. Long-term studies have shown that children born as a result of in vitro fertilization are as healthy as children born after natural conception. Still, not all attempts are successful and not all pregnancies go smoothly. Some doctors transfer more than one embryo to improve chances of a pregnancy, but multiple births can lead to greater risks during pregnancy and after delivery. Widespread attention to Nadya Suleman, the mother of octuplets born in California in 2009, has led to more discussions about ethics and limits of in vitro fertilization. Doctors say the goals now are to improve the success rate, especially for older parents, while reducing the number of multiple births. Then there's the bigger question: How to prevent or treat infertility altogether? "We're bypassing. The couples are still infertile," DePaolo said. "We need to pursue the root causes of infertility and have better treatments, and ameliorate the major reasons to need in vitro fertilization." That, they said, could be the work of future Nobel Prize. CNN's Madison Park contributed to this report.